Alcatraz Virtual Tour. Full version. 725 high quality large 752x500 photographs. On the way to Alcatraz from Pier 41, around the island and prison. A little rock island surrounded by cold waters of San Francisco Bay. In the view of the whole city. It used to be an artillery battery here to protect the land. With changing technology made old guns obsolete, the better application was found: for a prison from where no one is supposed to escape. Not for long. The abandoned island became a national park where millennia-old natural wonders are neighboring with history and deteriorating concrete buildings. It is a research: for how long they can stand ? Surrounded by breathtaking views the island attracts millions of tourists. It used to be only one way to get there. By boat. Now there is another one. This virtual tour gives your an opportunity to board the boat, land at the island and visit all of its accessible trails, panoramas, and buildings: from a prison to a nature trail. This is a Windows autoplay CD-ROM. 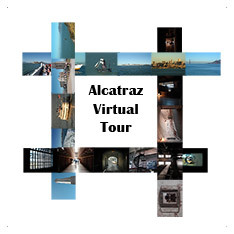 Insert it into a computer and your Internet Browser will start with the presentation of the same page as on my website which lists all entries to the Alcatraz Virtual Tour as thumbnails you can click on. The main difference is the size of pictures in the tour: they are large, and there is no limitation on how far you can go. Also you can run it in the "Auto Mode" to serve as a slide show, but better..
Once you click on one of the thumbnail images a virtual tour page appears bringing you to a specific place at the island or prison. A Java applet is used to run the virtual tour. If you tried the tour here, on internet, it will work for you. Java is a part of all modern computers systems. If needed, one can always get Java here. The cursor changes when you move it around the picture. It shows you where you can go. Make your choice and click. It brings you to the next picture. At any time you can come back with the [Esc] key, or preview available directions with the [z] or [Ctrl] keys. You can turn left, right, go forward, look at items, or even jump. This is the way it is supposed to be in a virtual tour, isn't it? If you wish you can toggle the "auto mode" on with the [a] key and let the computer intelligently guide you around. It is more than a screen saver slide show. The computer wonders all around the island looking into every hidden corner and a room. It chooses a new path and presents you with pictures you might miss. There are many crossroads which makes the way never the same. This is a new art form! Photographs are made and arranged in a tour by Igor Polk. The CD is cut in a studio, and all inserts are printed on a quality photo paper. Each CD is signed by the photographer. You can personalize it. Let me know what text you want to be printed or written and where. The CD was ready in 2005, pictures were taken in the second half of 2004.